An Excel pivot table summarizes and displays on a report all the records in your source data table. 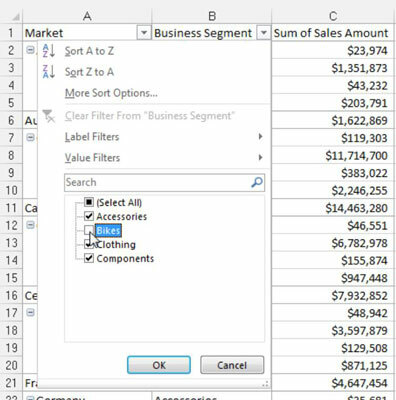 There may be situations however, when you want to inhibit certain data items from being included in your pivot table summary. In these situations, you can choose to hide a data item. 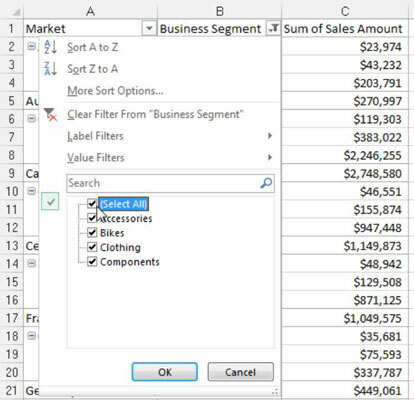 In terms of pivot tables, hiding doesn’t just mean preventing the data item from being shown on the report. Hiding a data item also prevents it from being factored into the summary calculations. 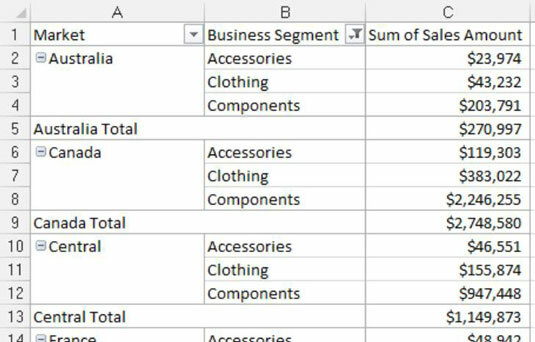 The pivot table illustrated in this figure shows sales amounts for all Business Segments by Market. This is an example of showing totals without taking sales from the Bikes segment into consideration. In other words, it hides the Bikes segment. You can hide the Bikes Business Segment by clicking the Business Segment drop-down list arrow and deselecting the Bikes check box, as shown in this figure. 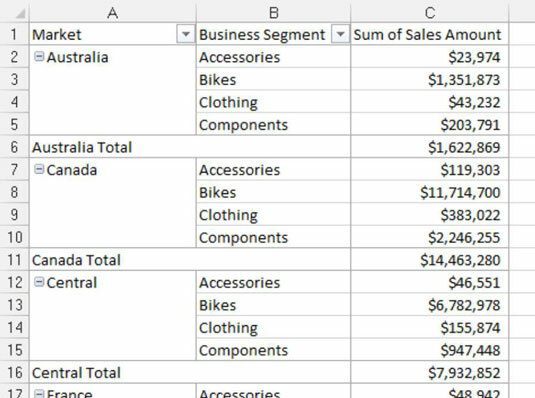 After choosing OK to close the selection box, the pivot table instantly recalculates, leaving out the Bikes segment. As you can see in this figure, the Market total sales now reflect the sales without Bikes. You can just as quickly reinstate all hidden data items for the field. Simply click the Business Segment drop-down list arrow and click the Select All check box, as shown in this figure.